You’re invited to meet ORCD2 Candidate Jamie McLeod-Skinner on April 24 at 12pm for meet and greet at Joe Beans coffee shop in La Grande. Come bring your questions and get to know why Jamie McLeod-Skinner is the candidate to vote for on May 15th. • Dedicated her life to public service. • Career has focused largely on water issues. • Family roots that span Oregon’s 2nd District from Jordan Valley to Medford. 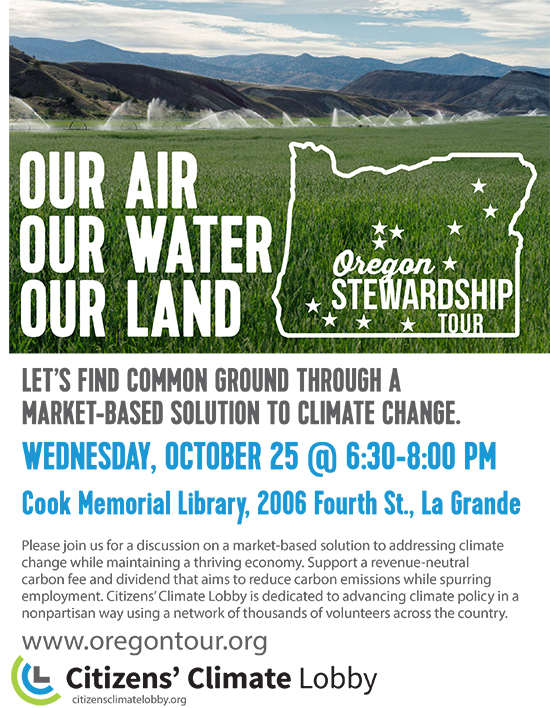 • People, not political parties, are what make Oregon such a great place to live. 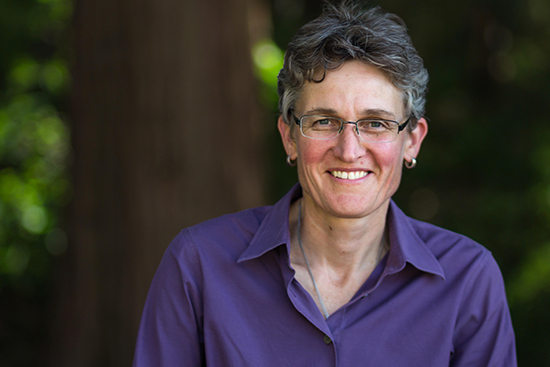 • Endorsements include the Oregon Education Association and Working Families Party. This is not an endorsement of any candidate for office by the Union County Democratic Party. This is a service available to all Democratic candidates. 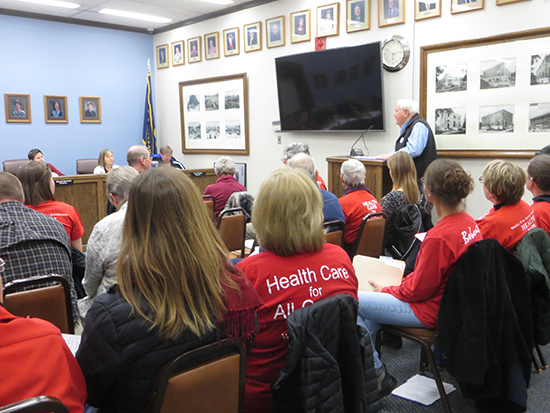 Health Care as a Human Right is one of the platform planks of the Union County Democrats and key to the Union County Health Care Resolution signed by 260 persons. 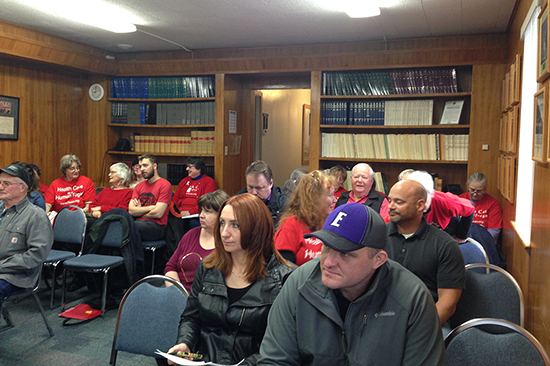 Thanks to the 23 of these supporters that attended the 1-17-18 Union County Board of Commissioners meeting. Eleven (11) supporters shared personal stories about: working only to access health insurance; high monthly cost of personal policies exceeding $1,000 for one person plus additional cost of health care; responsibility of government to provide healthcare as a "public good"; physician and nurse telling how patients post-poned accessing health care because of the cost; tragic physical outcomes for people with no access to health care; financial impacts on young people who have no access to affordable medical care; emergency rooms used for health care by people with no other resources; 60% of US bankruptcy due to cost of health care (and most had insurance) and more. 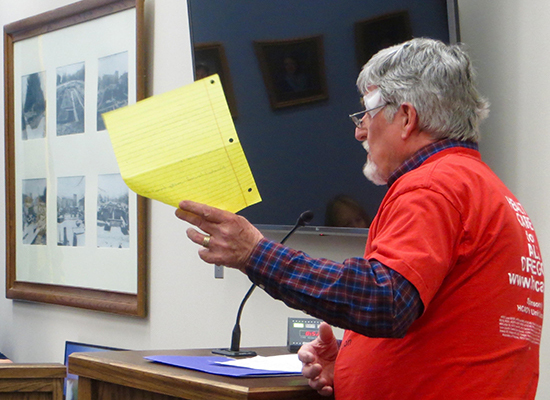 Health care resolutions like this have passed in other parts of the state. Union County has been a state public health leader in the past, now is time to step up again and provide leadership in Union County and ask the Oregon legislature to bring a vote about health care to the people in 2020! The Resolution was referred to a Commission work session on February 14, 2018. We support Healthcare as a Human Right -- It is a moral outrage for a country as wealthy as ours to leave 60 million people with no reliable access to health care and tens of millions more with inadequate or overly expensive coverage. In addition, despite spending nearly twice as much as other developed nations on health care, our system performs poorly, because the private U.S. insurance bureaucracy soaks up as much as one-third of all the money and pharmaceutical interests overburden America by avoiding price competition. 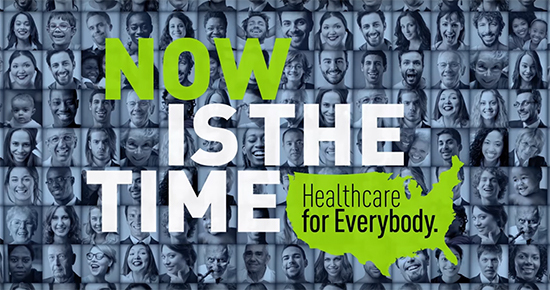 The Affordable Care Act and the proposed American Health Care Act must be replaced with universal, publicly funded Improved Medicare for All HB676. Join us January 17, 2018, 9:00 am when petitions will be presented at Union County Board of Commissioners, 1106 K Avenue, La Grande. 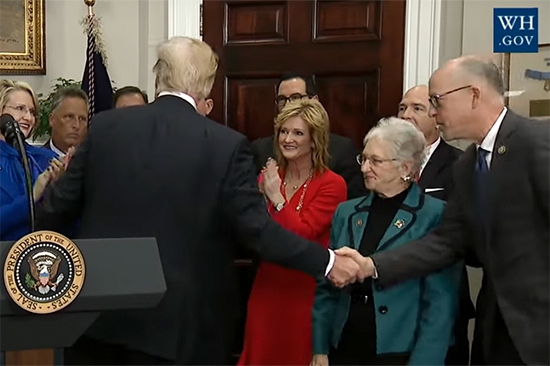 US Representative Greg Walden [R-OR2] bowing in praise to President Trump after the signing of another executive order designed to undermine the stability of the health insurance system for all Americans, October 12, 2017. This is not an endorsement of any candidate for office by the Union County Democratic Party. This is a service available to all Democratic candidates. 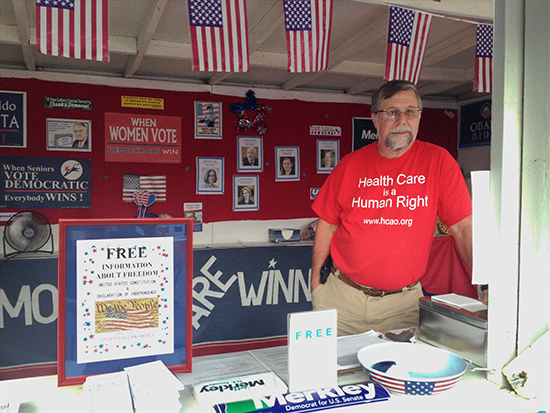 Dwight Dill, member of ORA Health Care Reform Action Team volunteers at the Fair Booth. Why Should We Protect Medicare? 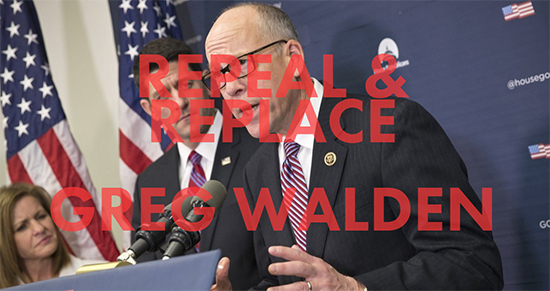 Stories for the Pill Bottle Campaign for Rep. Walden! Recognizing Medicare's 52nd Birthday! Join the Oregon Rural Action Health Care Reform Action Team (HCRAT) 6:00-7:00 pm, Tuesday, July 18th at the ORA office. 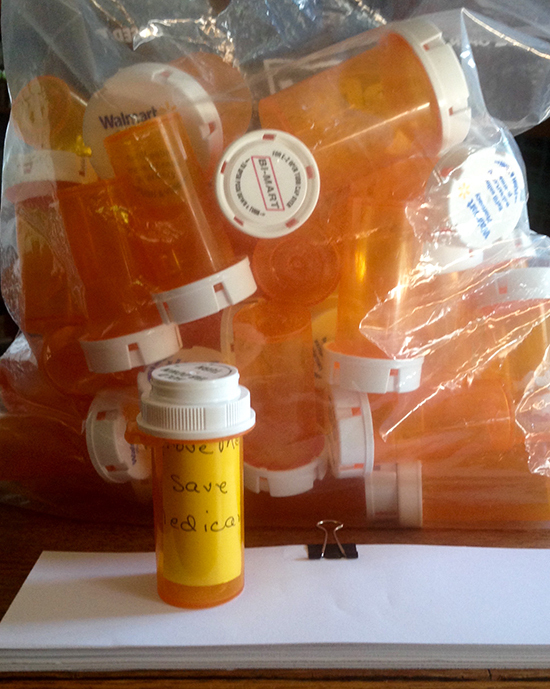 We are filling hundreds of pill bottles that will be displayed at the July 29th Farmer's Market and then presented to Rep. Walden expressing our concern for proposed changes to the Medicare program. Don't Repeal - Improve Medicare for All! The room was full with people standing in the back and along the sides. The film received a rousing round of applause! Thanks to the great group of people from sponsoring organizations that planned, promoted and produced this 2-hour community presentation. Special thanks to our panelists Gene Uphoff, MD; Kathy Phister-Minogue, Retired MSN; Rebecca Tilley, RN Surgical Nurse, Steve Clement, La Grande City Mayor and Moderator Thorman Hulse. Universal, publicly funded healthcare -- single payer -- the only way to go. Everybody in and Nobody out!